There are plenty of refinements and new features in the public beta of Adobe Lightroom 4, but the two tools that caught my eye are the robust video handling capabilities and soft proofing. I cover both of these, and more, in my latest Macworld Magazine article, Adobe Lightroom 4 Beta shines with new video capabilities. The Lightroom 4 public beta can be downloaded from the Adobe Labs site. You don't need prior versions of the application to try the latest. Once the final release comes out, you either have to buy it, or take the beta off your hard drive. Even if you aren't a Lightroom person, this release is notable for a couple reasons. First, you get to see and test the areas of image editing that Adobe thinks is important. Recognizing that their emphasis is on video, personal books, and printing and web output, helps us see overall trends in photography. I also think that Aperture 4 is probably not far behind. The competition between Adobe and Apple is fierce in this area, and my guess is that we will hear something about a new version of Aperture before long. In the meantime, there's much to enjoy with this Lightroom release. Check out my Macworld article for more information. Some of the biggest features, like the books, handling of video clips, sending emails seem to be features that already in Aperture3! Now if Aperture could give us lens correction, a new alternative to Mobileme (that's built in, not a3rd party plugin) like SmugMug. that would be great! That's a great point, Ian. Adobe has shored up some areas that it was behind Aperture in. Now if Apple can add some of the features that Aperture was behind Lightroom in, we'd have some real fun. Thanks for your quick review, Derrick. I've been waffling on switching to LR from Aperture but will hold on until A4. I really like the "Clarity" slider in LR. Is the "Definition" slider in A3 the best way to accomplish the "Clarity" look? Hi Scott, Yes, the Definition slider in Aperture is pretty much the same as the Clarity slider in Lightroom. It improves mid tone contrast with a dash of sharpening there. As for Lightroom vs Aperture, I would wait for the final release of Lightroom (remember this is only a beta) and the release of Aperture 4 before making a decision. That would be the best comparison. Some of the new features are very cool while others, such as easy email integration should have been in there from the start. I mean Picassa, which is free, has had this for years! As for Aperture vs Lightroom, I am just finishing up a move from Aperture to Lightroom. Two reasons for this: firstly while I love Aperture's interface it is so slow on my ageing iMac whereas Lightroom is snappy. Secondly Apple refuse to produce a consumer level desktop tower which is what I want for my next desktop so switching to Lightroom gives me the option to work on both Macs and Windows PCs. 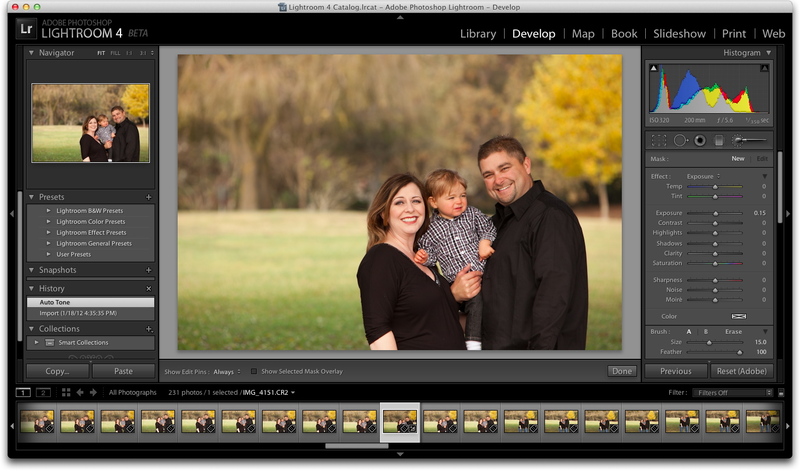 Good review via the MacWorld Magazine on Adobe Lightroom 4 Beta. I have gone back and forth from Lightroom to Aperture. I tend to lend toward Lighroom. One reason is the fact the X-Rite Color Checker (software) works with Lightroom. Now with the new soft proofing function available in Lightroom 4 Beta that will even keep me more with Lightroom. One problem that I am concerned about with Aperture is Apple going to keep that program as a pro program? I had originally paid nearly $200 for Aperture when I first purchased it. Now it is less then $80 via the App store. I am sure not complaining about the lower price as this is a smart marking move for Apple. Now with that said do you think Apple will continue upgrading Aperture or will they do away with iPhoto and replace it with Aperture and be included with their new OS update? I guess the question is, will it be worth it for Apple to keep two photo software editing program going? Hey, I think Apple will continue to keep Aperture at the Pro level. iPhoto is their consumer photo management program, and I don't see its demise in the foreseeable future. There tends to be more discussion about Apple's commitment to Aperture right before a big release, then things quiet down afterward. I suspect this will be the case once again. For Next version of Aperture, I think Apple will allow Picture Books to be published either directly to AppStore or send to iBooks Author with or without ISBN.